This mini-vacation trip took us to the George Bush Library in College Station, and to historic Bastrop and Columbus. We left Richmond on Sunday, May 5th and traveled north on TX-359 through beautiful Texas farm and ranch land to Hempstead, then north via TX-6 to College Station. We camped at Primrose Lane RV Park in Bryan. 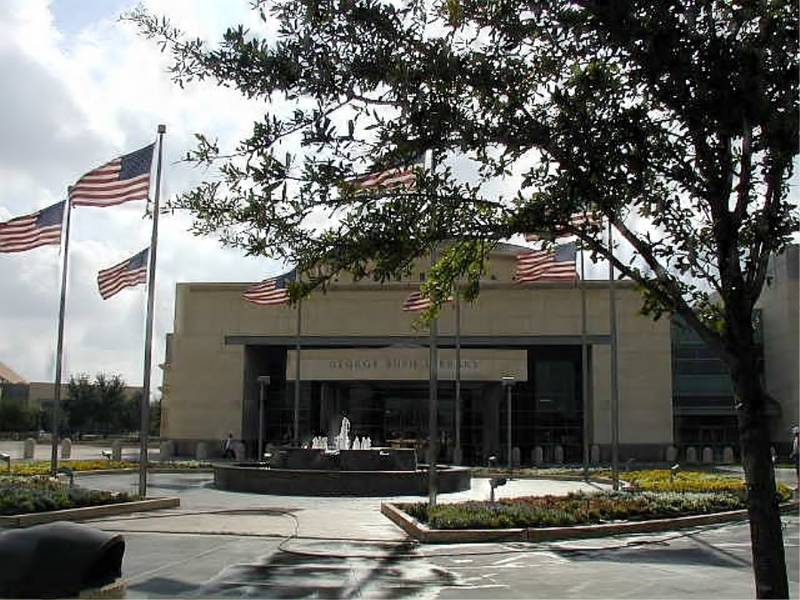 We spent Monday touring the George H. W. Bush Presidential Library on the Texas A&M University campus. 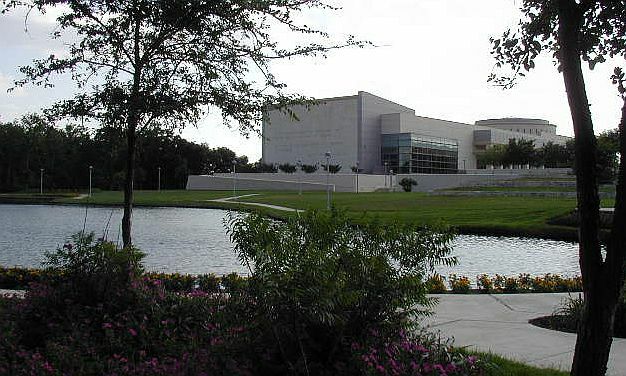 It's the first presidential library and museum we have visited and is well worth the day that it takes to fully explore it's treasures. 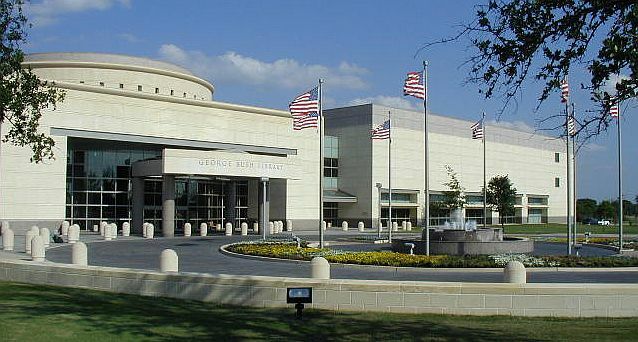 ^ Front view of George Bush Library. 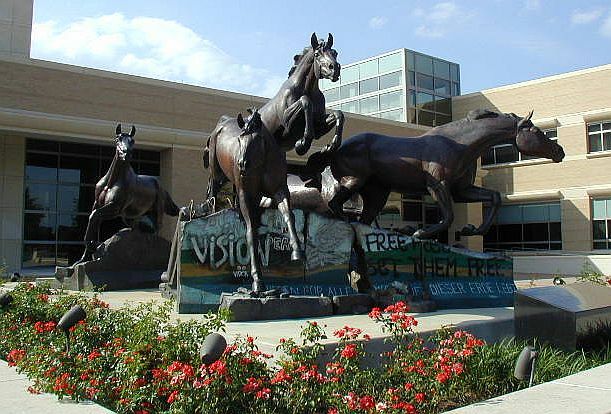 ^ Back view of George Bush Library. ^ Sculpture symbolizing the tearing down of the Berlin Wall. An actual large section of the wall is on display inside. 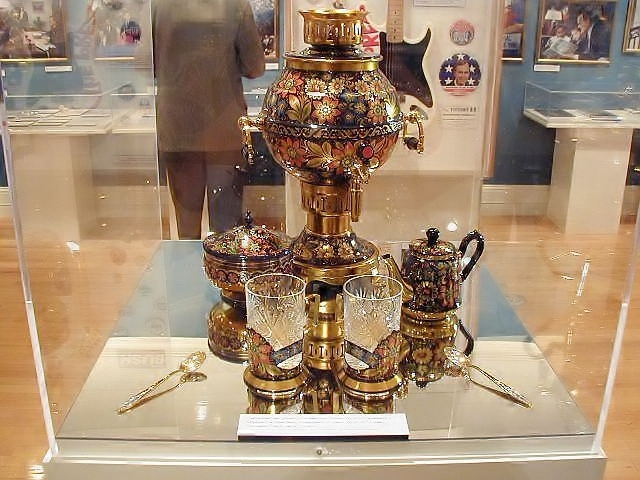 ^ Gift to President Bush from Mikhail Gorbachev of Russia. 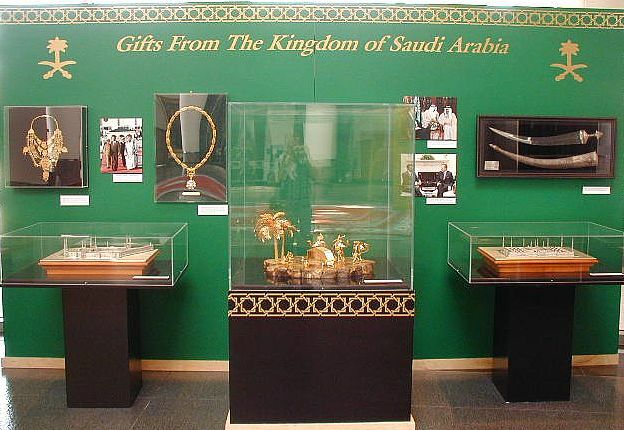 ^ Gifts from the Kingdom of Saudi Arabia to President Bush. Tuesday, May 7th, we left Bryan via TX-21 and traveled to Bastrop State Park, just northeast of Bastrop. We camped in the Copperas Creek camping area under the towering "Lost Pines of Central Texas." We spent the afternoon exploring some of the hiking trails. 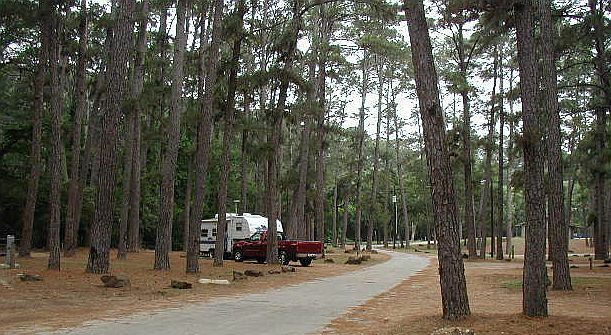 ^ Our campsite at Copperas Creek Camping Area of Bastrop State Park. 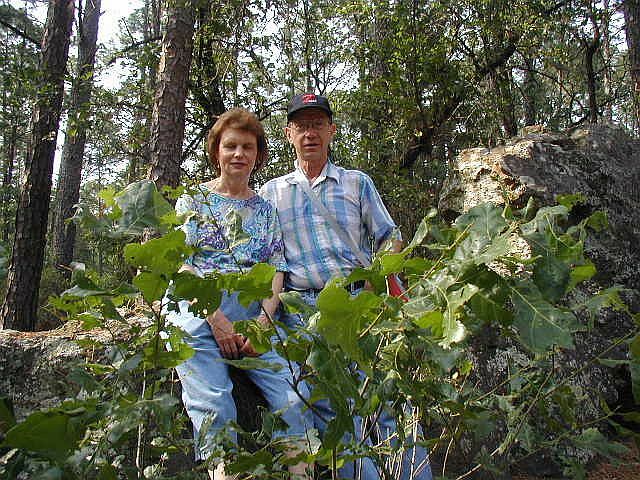 ^ Kay and Lawson taking a break on the trail in Bastrop State Park. Wednesday we drove into Bastrop. 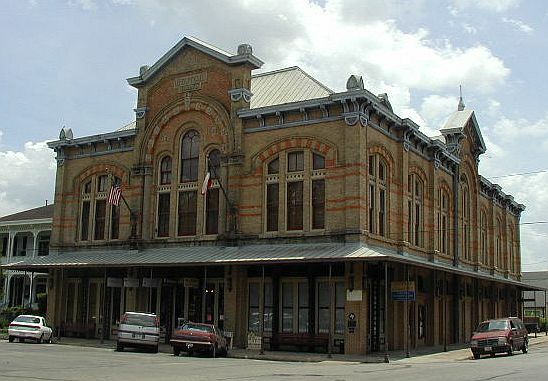 Bastrop has over a hundred historic homes and businesses. It was named in 1837 for the Baron de Bastrop, a colorful impostor of Dutch nobility. We toured the Historical Society Museum as we took the walking tour of the downtown historic district. The 1891 Old Bastrop County Jail is an example of late 19th century second empire Victorian and a favorite location setting for TV and movie crews filming in Bastrop. 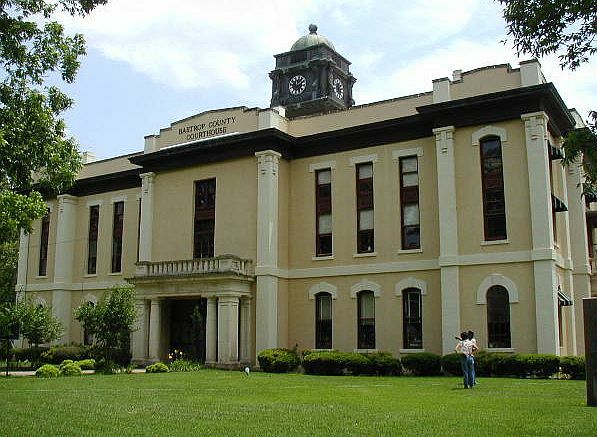 The Bastrop County Courthouse, built in 1883-4 and substantially altered during the 1920's, is adjacent. 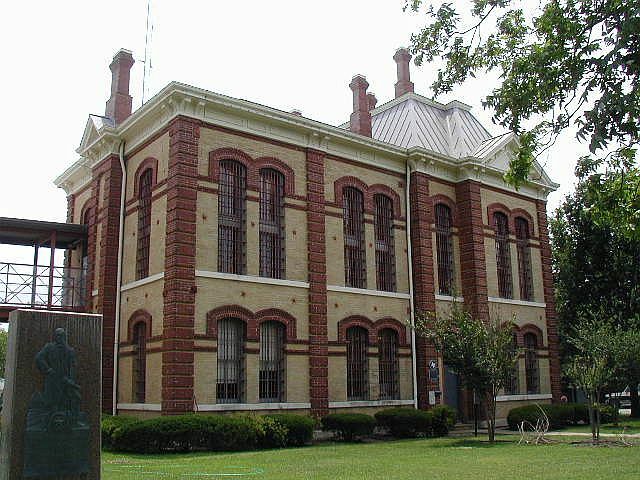 ^ The Old Bastrop County Jail was built in 1891. 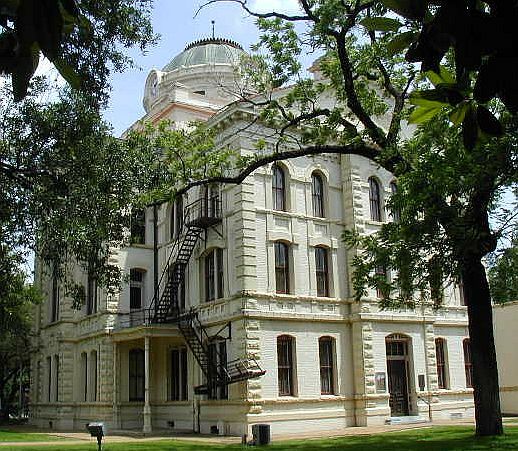 ^ The Bastrop County Courthouse was built in 1884. 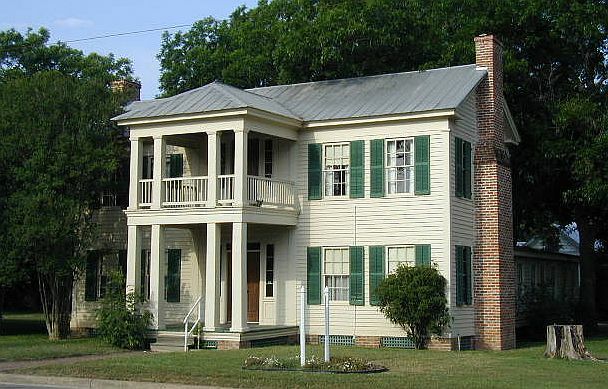 ^ The William Reding House was built in 1860 and was featured as an example of Greek Revival architecture in the book, A Field Guide To American Houses. Thursday we needed to take care of some business in Houston, so we pulled the trailer back to the Brookshire KOA via I-10. Friday morning we pulled the trailer back west on I-10 to Columbus and parked it at the Columbus R.V. Park. That afternoon, we toured the Old Town Columbus Historic District. Columbus is the oldest surveyed and platted Anglo-American town in Texas. It was laid out in 1823 by some of the original 300 families of the Stephen F. Austin Colony. It is locate on the Colorado River at the original site of an Indian village called Montezuma. During the Texas War for Independence, the buildings were burned by the Texas Army, to keep them out of the hands of Santa Anna, but after the Texas victory at San Jacinto in 1836, Columbus rose again. The townsite was platted in 1837. Highlights of our tour were the 1886 Stafford Opera House, the 1883 United Daughters of the Confederacy Museum, the 1836 Alley Log Cabin Museum, and the 1891 Colorado County Courthouse. ^ The Stafford Opera House was built in 1886. 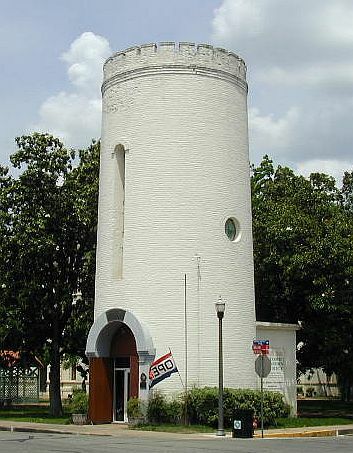 ^ The United Daughters of the Confederacy Museum originally housed the city's fire department; the water tower was constructed with 400,000 bricks in 1883. ^ The Colorado County Courthouse was built in 1891 in the Second Empire Style of brick from local clay. It features a magnificent stained glass dome in the District Court room. On Saturday, we took TX-102 south to Eagle Lake, then US-90A back home to Richmond. Along the way we passed through more nice farmland. 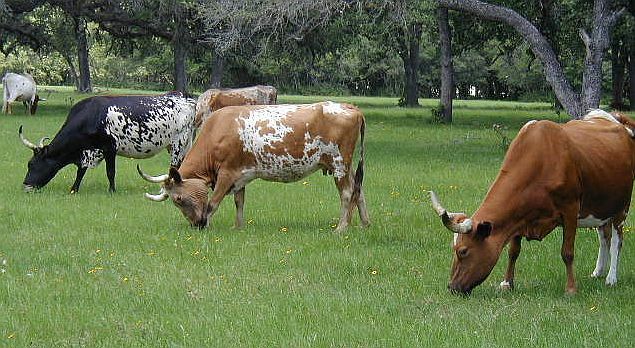 ^ Longhorn cattle graze alongside TX-102 south of Columbus. This ends our East Central Texas Mini-Vacation. We hope you enjoyed the pictures and brief descriptions of our activities. God willing, join us again for another RV adventure soon.